omg after so many days and tries i finaly made the truck mirrors export correctly. pics coming soon. ;D BTW Robert you should try and get the pete 379 from RNR. that would be sweet to have. 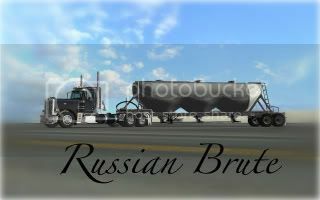 I'll do the tanker from Truckerdude ingame (wip), wheels from Ventyres with a new mapping. Wow!!! xxXxx your truck looks awsome!!!!! thanks man. heres a couple more. That turned out fantastic X.
thanks. i made some new doors for my trailer. I also fixed a ton of mat files that make the loading of the truck allot easier. currently working on making my round mirrors work. so far only the right side works.